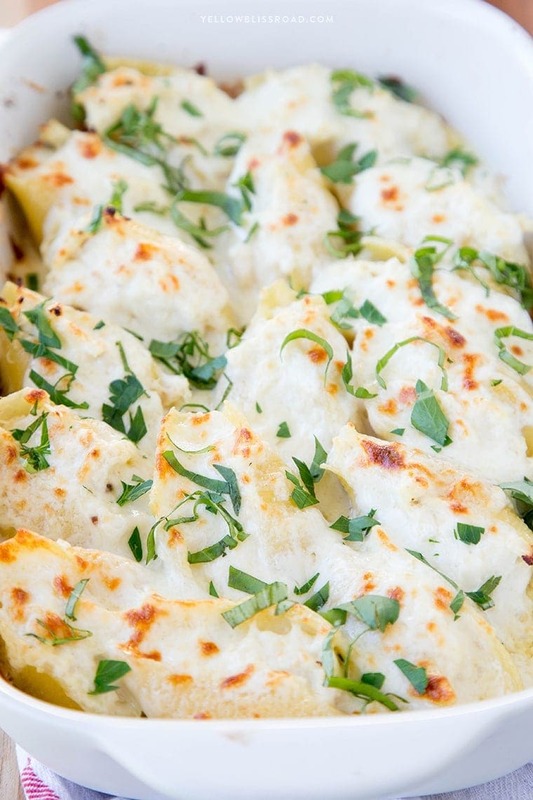 Chicken Alfredo Stuffed Shells are easy and so creamy and delicious. 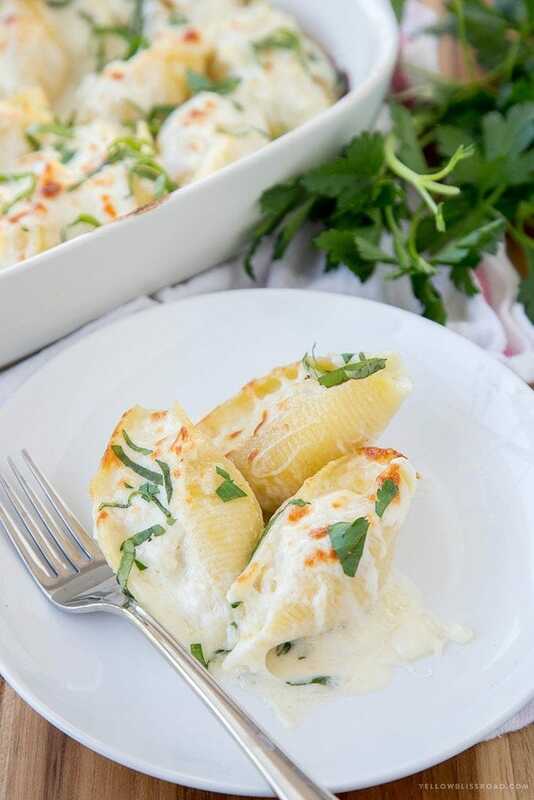 Stuffed with chicken, mozzarella, Parmesan and chicken and topped with a creamy homemade Alfredo sauce, these stuffed shells are perfect for a quick weeknight meal but still classy enough for company. My best friend and I have quite similar palates when it comes to food. We have been lunching together since we were in high school, and we have our favorite local and national restaurants. Don’t scoff, but Olive Garden is one of those places. I know some people swear that Olive Garden isn’t “real” Italian food, but if it tastes good, who cares? Since we have similar tastes, we tend to order the same food and drinks when we go out. At Olive Garden the Chicken Fettuccine Alfredo is always one of those dishes. Tender pasta, creamy alfredo sauce and savory chicken…it’s definitely a winning combination and one that I enjoy replicating at home. 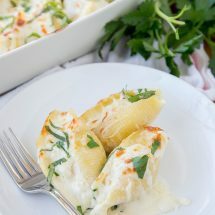 As my family sat around the table enjoy these Stuffed Shells, I couldn’t help but wish for some Olive Garden salad and breadsticks to go with it! I’ve been wanting to try out these stuffed shells for a while now, but I wanted to do something that wasn’t the typical red sauce version. The stuffing is shredded chicken and four kinds of cheese – Ricotta, Mozzarella, Parmesan and Romano. The sauce is a simple Alfredo with only 3 ingredients – butter, heavy cream and Parmesan cheese. 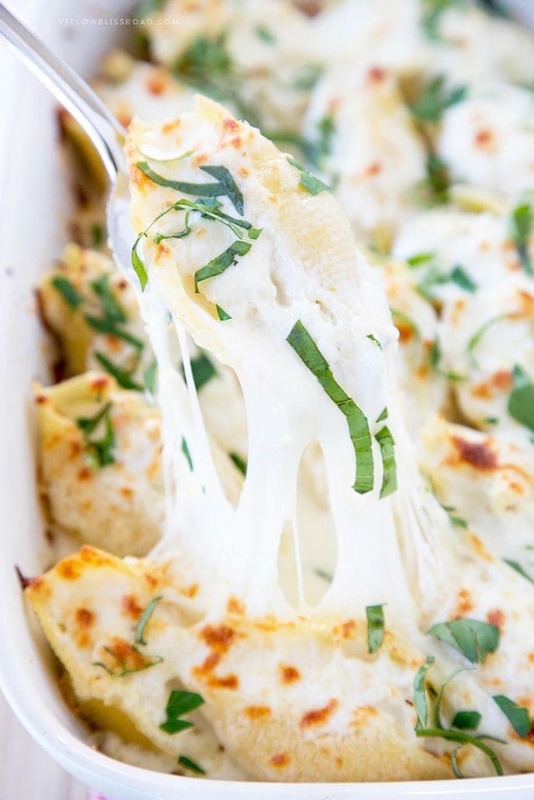 Stuff the shells, top them with the Alfredo and more cheese, and you’ll have a winning dish your family will be begging you to make again! Alfredo Sauce seems to be one of those sauces that people are scared of, but it couldn’t be easier to make. Melt some butter, cook some garlic, add some cream and melt some Parmesan. It’s literally as simple as that! The most traditional way to serve Alfredo sauce is over Fettuccine, but Chicken Alfredo is my favorite, no matter what kind of pasta you serve it on…or in! For the Stuffed Shells version, the sauce actually only goes on the bottom of the pan and then is spooned over the stuffed shells. Cook the pasta shells to just before al dente. Anytime you’re baking cooked pasta, you run the risk of overcooking it and making it mushy. Cook it about 1 minute under the recommended time and it will still have a nice bite to it. Cool the shells completely before stuffing. Hot pasta has a tendency to tear when you’re trying to stuff it. Cooling the shells makes them not only easier to handle, but they will hold their shape much better. Use a medium cookie scoop (aff link) for stuffing the chicken mixture into the shells. This makes the stuffing process so much easier! Just scoop the chicken mixture and release it into the shells. I use about 1 1/2 scoops to fill each shell. 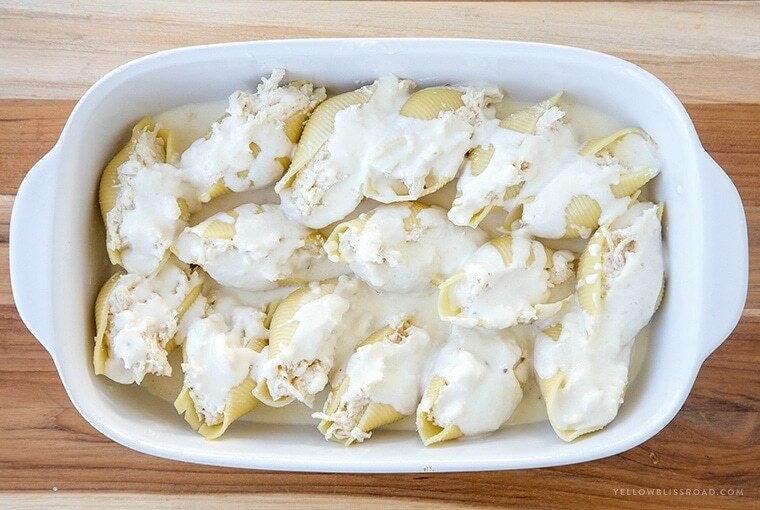 Once the shells are stuffed and arranged in the baking dish, spoon on the alfredo sauce, sprinkle with cheese and bake for about 15-20 minutes. Boil pasta shells to almost al dente (about 9 minutes). Drain water and lay on a flat surface to dry and cool. While the pasta shells are cooling, make the alfredo sauce and the chicken filling. Melt the butter over medium heat in a medium saucepan. Add cream and bring to a gentle boil. Remove from heat and stir in the 3/4 cup Parmesan cheese. Set aside. Sauce will thicken as it stands. spraying with nonstick cooking spray. Combine Mozzarella, Romano and Parmesan together. Reserve about 1/3 cup for topping. In a large bowl, combine cheese mixture and Ricotta Cheese with the egg and a pinch pf salt and pepper. Stir in shredded chicken. Spoon half of the Alfredo sauce into the bottom of the 13"x9" baking dish. Stuff shells with the chicken mixture (a cookie scoop works really well for this) and arrange in a single layer in the baking dish. 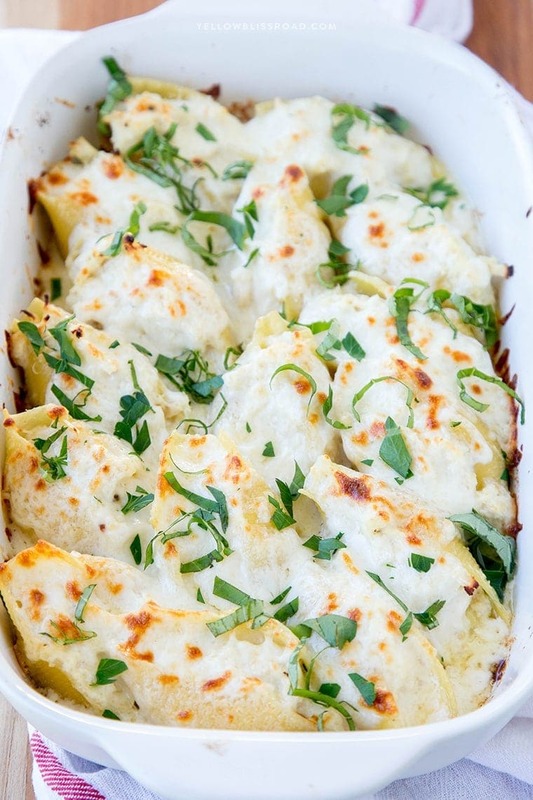 Spoon remaining Alfredo sauce over the stuffed shells. Sprinkle with the reserved 1/3 cup cheese mix. Bake in the preheated 350 degree oven for 15-20 minutes, or until cheese is lightly browned and bubbly. Garnish with fresh basil and parsley, if desired. Have made these a few times. All of my kids LOVE it! Having five, that’s extremely difficult to accomplish. Thank you so much for this recipe. My kids love it too! So glad your family did too!! This looks amazing! Can’t wait to try! Can I make this ahead and then bake it? Or Wil the shells get soggy over night? I haven’t tried that so I’m not sure. But the sauce probably wouldn’t reheat as well so I’d make that when you are ready to cook. thank you . trying to night, but forgot the cream, just using milk . let you know. Milk should work, it just won’t thicken quite as much or taste quite as creamy. Not sure where the ricotta cheese gets combined. You’re right, that wasn’t clear – it’s part of the “cheeses” that are mixed with the egg. I’ve updated the recipe to make it clear. I saw the picture of stuffed shells & some comments but no recipe. Hi Patricia, I am still seeing the complete post and recipe. Maybe try clearing your cache and trying again? 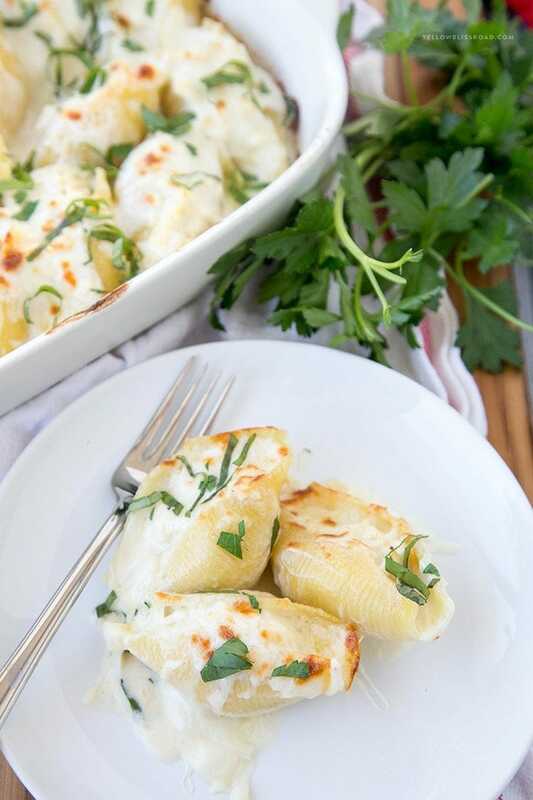 Where does the ricotta cheese go?…can you be more specific on how much parmesan goes into the sauce and how much goes into the filling? I’ve updated the recipe to make it more clear. Sorry for the confusion!